Our company spokesperson said , "The tests are still in their preliminary stages. We need to duplicate the effect in many ways before moving forward with development of a possible vaccine." The paper stated that a human subject was administered the inhibitor referred to as XL6, after it became known that he had contracted the virus. "Typically an exposed person will begin showing signs of decay and mortification within one or two days. This subject was able to offset the effects of Necro-mortosis for seven days. During which time he was in a healthy and stable condition." Unfortunately, on the seventh day, he developed a sever flu. The virus attacked his central nervous system shortly thereafter. He was terminated shortly after reanimation on the eight day. Studies in Berlin suggest that Antiviral test drugs can interrupt the process by which a virus reproduces at several stages. The inhibitor XL-6, for example, prevents the virus particle from opening after it enters the cell and can inhibit the manufacture of virus proteins. It also stop the virus from exiting the cell. The Bush presidency signed a legislation banning the use of three of the five listed stem cells needed to proceed with development of the XL6 Mortosis inhibitor. 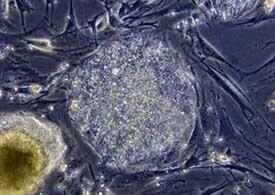 To use an embryonic stem cell, scientists must have access to an embryo outside the woman’s body. The embryo is only allowed to develop for a few days before termination. Researchers isolate and remove the stem cell from the embryo thereby destroying the embryo in the process. XL-6 passed all in-vitro trials successfully. Cell culture and in-vivo. This step is essential to ensure the safety of early stages of human trials. The phase 1 is the first drug administration in humans. It is not generally used to test the efficacy of the XL-6, but to assess its effect on human metabolism, its pharmacokinetics (the speed with which the drug is absorbed, distributed, metabolized and excreted by the human body), dosage and possible side effects. Phase 1 is generally performed on 20-80 healthy subjects. Very low doses of the drug is administered initially and then gradually increased. Drugs that pass the first phase of clinical research are ready for the tests of Phase 2. During this, XL-6 is tested on a small group of patients who suffer from early stages of necro-mortosis. This is a first measure of efficiency, but Phase 2 serves primarily to determine the best doses and routes of administration (oral, intravenous) and to confirm the test results of phase 1. The Phase 3 is the first phase of clinical research where the XL-6 is administered to a larger group of patients. It is to confirm the large-scale efficacy and safety of the inhibitor. It can take several years and enroll several thousand patients. After this phase, the pharmaceutical company sends to the competent authority the application for authorization of placing the drug on the market. Based on the results of phases 1, 2 and 3, it accepts or rejects further investigations. Due to stringent guidelines as set by the World Health Authority XL-6 was required to enter phase four testing also. Preliminary tests In Germany, Spain and Peru were conducted throughout 2010-11. We also intended to introduce testing (as results progress) in the U.K., Japan and South Korea in 2012. Phase 4 testing has failed to reach expected levels of success in extending test subjects lives and resistance beyond 9 days. After extensive retesting Amcalon has decided to temporarily suspend all further testing until further notice. All test subjects were voluntary. Both mortosis negative and mortosis positive patients were administered XL-6 under strict supervision and monitoring. Also, reanimates were used with legal release signed by immediate family members only.